Vasquez is a professional Brazilian jiu-jitsu trainer with Renzo Gracie School out of Nyack, New York. He said students acquire scores of academic and soft skills through the program. “It’s a different story for everybody,” he said. 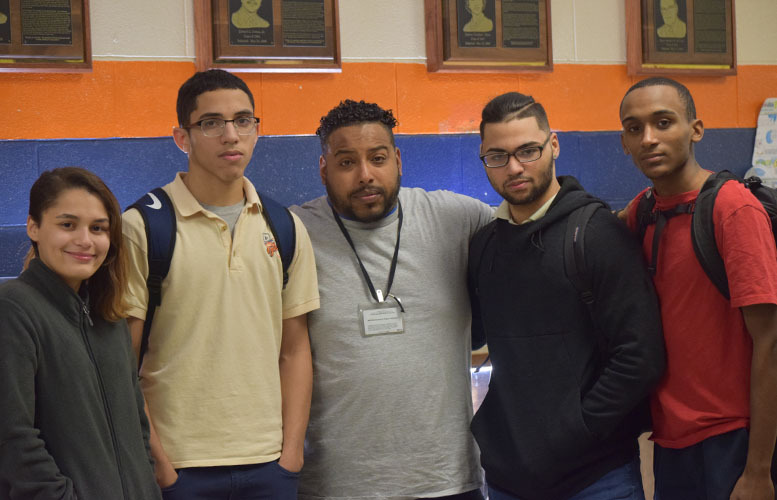 Veronica Aponte, Dewar Lausell, Anthony Vasquez, Porfirio Matos, and Bryant Polanco (left to right). Four of his students shared their experience at Eastside High School in late January. Polanco was introduced to the program by a friend towards the end of his sophomore year. The students practice three days a week after school until 6 p.m. at the Wrestling Room. The program runs from Sept. to Thanksgiving. It halts from Thanksgiving until mid-February for wrestling. And begins again from mid-February, according to the coach. Vasquez started the program at Eastside High School three years ago. He said it started with six students and grew to 45 at one point. “People come and go,” said the coach. 15-20 are regulars. There’s also a second program at John F. Kennedy High School that has 25 students. He coaches students at both schools, he said. Vasquez has managed to fill a trophy case in the Eastside High School hallway with medals, swords, and belts his students won in competitions over those three years. “We’ve done pretty well in competitions,” said Vasquez. Every year students compete in three tournaments in the New York, New Jersey, and Connecticut. 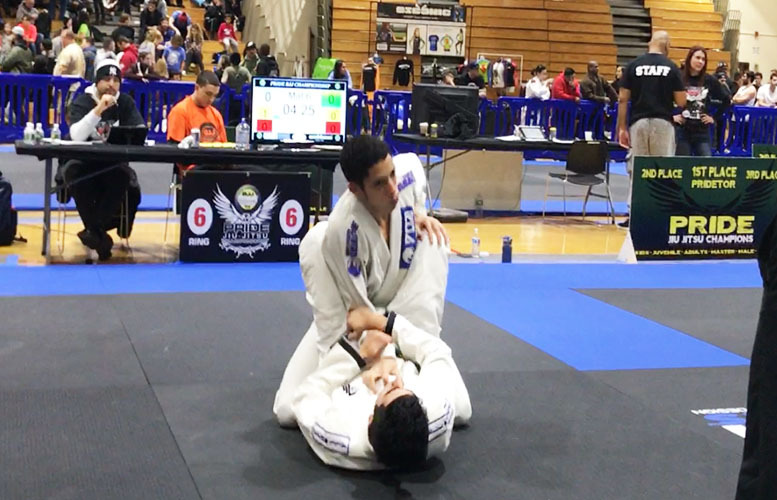 His students have competed at the Long Island Pride Brazilian Jiu Jitsu, North American Grappling Association (NAGA), KASAI Elite Grappling Championships, and the International Brazilian Jiu-Jitsu Federation (IBJJF) contests. Dewar Lausell, another junior at the School of Information Technology at Eastside High School, joined in October and won first place at a competition held at John F. Kennedy High School last December. Sprawling is when he’ll put his weight on his opponent to get away, said Lausell. He gives credit to his coach for his first competition victory. “It was a struggle. But it felt great when they raised my hand,” said Lausell (pictured, top). “They train to win,” added the coach. “I quit like three teams because of warm ups,” said Porfirio Matos, another junior at the School of Information Technology at Eastside High School. Matos never officially quit. He simply decided not to show up. Matos, 17, faced a 23-year-old opponent at a competition. His opponent tapped out. Aponte has been taking jiu-jitsu since she was a freshman, she said. She said it has helped her to focus on school work. When asked if she has beaten any of the guys, Aponte giggled while Polanco’s face turned red. She had beaten Polanco in a match. Vasquez wants to see the program grow. “The ultimate goal is to create a jiu-jitsu program as a sport,” he said. He said he does not know of any other school district in New Jersey that offers jiu-jitsu. Jiu-jitsu training is expensive. It can cost more than $100 month for dojo membership. His students get the training for free. The program also keeps them safe. At least in Aponte’s case, several weeks prior, she thwarted an abduction attempt. She escaped and got to safety by running to school grounds.